These are lyrics by Ja Rule that we think are kind of funny. 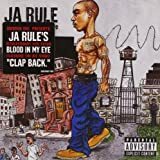 Ja Rule's, "Down For You"
God only looks after children and fools. well, ja rule, you are a fool and you do have kids so i guess God's got your family covered.